The innovative feature of the US Carburetion Motor Snorkel™ Conversion Kit is the ingenious method of passing the fuel through the gasket portion of the device. Fuel is then channeled to the proper area in the carburetor so that the original carburetor can control the fuel mixture just the same as running on gasoline. Another amazing feature is the specifically designed probe that passes by the choke plate. A unique crush-proof yet flexible material was developed to allow the choke to be used on gasoline so that the engine can operate normally on gasoline without having to remove the Motor Snorkel™. 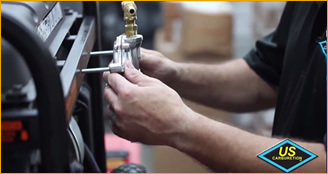 The Motor Snorkel™ Conversion Kit and other kits from US Carburetion are the best way to convert your existing gasoline generator into a propane generator, natural gas generator or a tri-fuel generator. 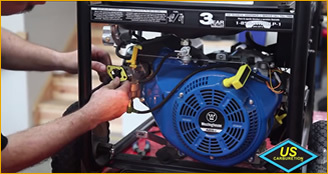 Professionals NEVER rely on gasoline as the primary fuel source for their backup generators because of its limited shelf-life and the tendency for this commodity to be hoarded during emergencies and disasters. 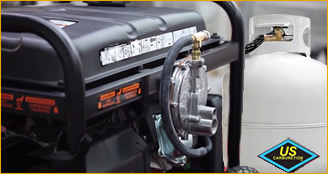 Now that you have invested in a backup generator, make sure that it runs when you most need it by converting it to use propane, natural gas or even convert it to use all three of the primary fuels (propane, natural gas, gasoline). No matter if you have a Briggs and Stratton engine on your generator or any other type of generator, we have a Motor Snorkel™ Conversion Kit to help with your do-it-yourself hybrid generator conversion. With 3 easy steps to install (depending on your fuel choice additional accessories may be required - see our accessories section for more details), our Conversion Kit will have your hybrid generator running in minutes. No cutting the frame or crank case, No need for stud extenders, and you can still use Gasoline in your generator when needed! HOW DO I BUY MOTOR SNORKEL? What primary fuel do you plan on using? Please take time to look over this page. It should answer most of your questions. Please click on any unfamiliar word to learn more about that term. Use your back button to return to this page. Propane cylinders are TANK pressure and what regulator "you" install at the cylinder or tank determines if high or low pressure comes out of the regulator.